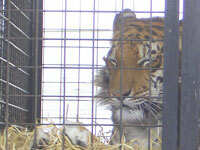 The largest wild animal circus in the UK is selling off its animals. Martin Lacey, owner of the Great British Circus told Horse and Hound magazine that he plans to go animal free. In 2009, ADI secured video footage of the elephants touring with the Great British Circus being viciously abused behind the scenes, by a worker and presenter. ADI also revealed how the circus had presented Parliament with claims that they did not chain elephants, yet continuous video evidence showed elephants chained every day, for up to 11 hours. A previous investigation of the circus (then known as Circus Harlequin), filmed tigers being beaten and screamed at, a lioness being smashed in the mouth by a tent pole, and a seriously injured lioness being concealed during a welfare inspection. Donate now and help us undertake more investigations and secure a ban in the UK. Mr Lacey’s group of four Friesians, a zebra and two other horses that perform a “little and large” act are advertised for sale in Horse and Hound. Mr Lacey said four other zebras had gone to a private collector along with some camels. Several other major British circuses once known for wild animal acts have become animal-free shows, including Gerry Cottle’s Circus (currently touring) and Chipperfield’s Circus. ADI currently has in its care 31 lions rescued from circuses. Read more about our investigation of the Great British Circus here.